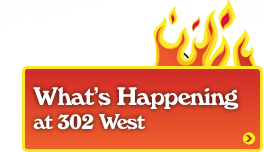 Sign up for the 302 Buzz! Here at 302 West, we know and embrace that happy customers are important to the success of any business. Feel free to contact us with questions, concerns or just to let us know what you’re thinking. We would love to hear from you and welcome your honesty!